Appalling service. I would never recommend it to anyone. We rarely received call backs or had to chase many times to get a response to email inquires. We felt like there was no genuine interest to complete work in a timely manner. We are living in the property for nearly 5 months and still paper work/land registry have not been complete! 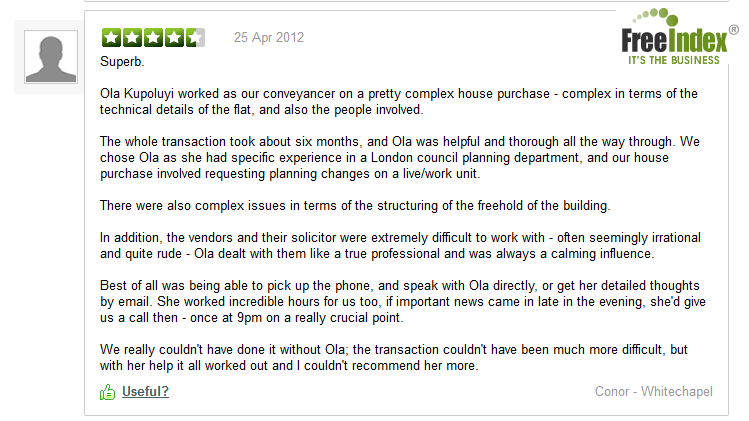 Thank you Elizabeth for your meticulous, persistence, hard work and patience with landlord that dragged their feet. Very much appreciated your advice and sensible head in getting the keys to the property to me over a protracted sale. So again thank you! Elizabeth has handled a few conveyancing transactions on my behalf over the years. She is professional always polite and above all very good and thorough in her work. She gives regular updates and responds to queries and concerns promptly . I strongly recommend her. I am sure you hear this frequently, however I would like to say a big thank you for the professional, prompt and meticulous service you have provided during my bridging loan process.I think you are a benchmark to the industry and a truly excellent solicitor. I will not hesitate to use your services again and I will definitely recommend you and your team should anyone require a proper solicitor's representation. I cannot recommend this company highly enough. Ayesha dealt with a very complicated case with the upmost professionalism. All communication was dealt with promptly. Ayesha often worked late and in her own time in order to get completion sorted quickly. Excellent service and I certainly won't look any further for a solicitor. Thanks again. Ayesha did a fantastic job in my case. She gave me good advise, provided clarification and pushed for things to happen quickly when needed. Also, always promptly responded to my emails. Elizabeth was fantastic with my property matter. Everything was clear from start to finish. I never felt nervous or worried, which is testament to the excellent service that Elizabeth provided. Thanks!